Satin isan older lady of around 6-7 years who has returned to Planet Guinea after outliving her two boarfriends. 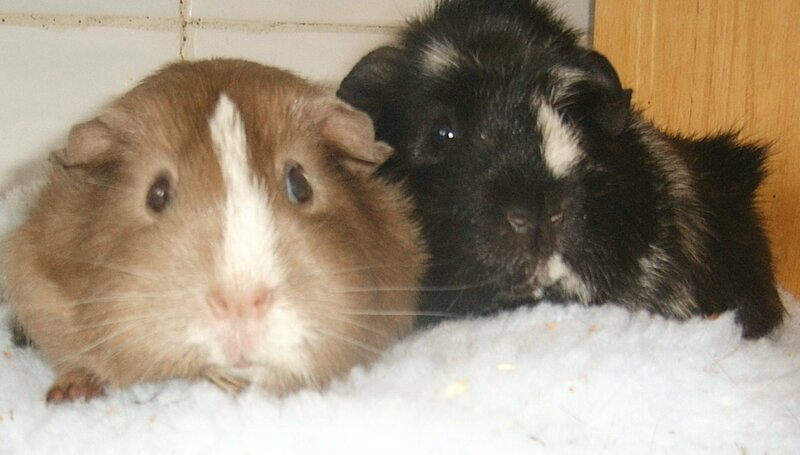 Satin arrived here as an unwanted pet with some other guineas and was rehomed with Stubbs. It wasn’t long before she was back again but this time she was back to choose a new boarfriend after the sudden departure of Stubbs. She chose Vincent (who later became known as Vinnie) as her new partner. Interestingly enough Vincent was Stubbs’ son! A few years passed and sadly so did Vinnie, Satin’s Humans knew that it was a choice between a new friend for Satin or giving Satin back so she could find a friend here. They decided that they no longer wanted to keep guineas and that they would return Satin. Satin with the black and white Stubbs. Satin’s white blaze has all but disappeared now.